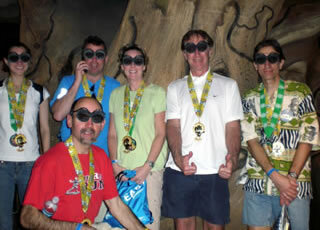 On the afternoon following the half marathon, Rebels wearing medals strolled around Disney's Animal Kingdom. "It's Tough to be a Bug!" was a hit. For some of us, the "Kali River Rapids" was a cool, wet experience. It's Tough to be a Rebel Bug! "An open-air safari vehicle takes Rebels on an exciting expedition through an African-style savannah where giraffes, gazelles, elephants, rhinos and lions roam freely."